The Gem-Like Turquoise Ice Found on Lake Baikal - article by Michael Zhang at PetaPixel. Photography by Alexey Trofimov. The ice is really amazing! This photo by Alexey Trofimov on his site is totally amazing. It may not seem like it at first, but look closer. The lake is frozen and is now showing a solitary crack. 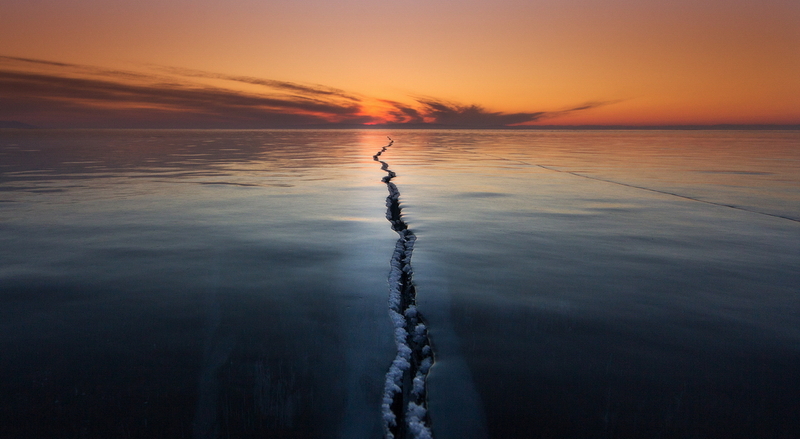 The crack itself is fascinating. The frozen body of water around it, even more so. He's got a lot of great stuff on his site to peruse. Tintype Portraits of Celebrities at the Sundance Film Festival - article by Michael Zhang at PetaPixel. Photography by Victoria Will. What a neat undertaking! She got pics of a number of popular peeps! Victoria Will has a fascinating site as well. More tintype pics, celebrity pics, and all sorts of stuff. I found this one rather fascinating. Doggy Photo Booth Helps Shelter Get Dogs Adopted - article by Michael Zhang at Petapixel. Photography by Guinnevere Shuster. What an incredibly cute idea!